Filed to: What was she thinking?Filed to: What was she thinking? According to Fox 6 News, Jan Zehren, a middle school PE teacher for 36 years, separated her seventh-grade gym class at Shorewood Intermediate School into groups based on their race and asked them to research games from their cultures. Apparently, Miss Zehren was satisfied when the white children came up with “Hide and Go Unseason” but it was the directive for black students to create American Gladiators: Plantation Edition that shocked the students. April 1st was a typical day in gym class until 7th grader Alexis Averette says she was assigned an odd game. While some students presented dodge ball, others say they were paired up by race and told to reenact slavery games. When Averette and her partner proposed another game, the students say they were told it was too common. When Averette told her parents her mother and father were shocked. “I’ve never heard of such a thing. I never knew slaves had opportunities to play games,” said Dr. Reshunda Stephens, a parent of one of the black students asked to come up with ideas for plantation recess, which traditionally took place between third-period whippings and fourth-period lynchings (You couldn’t imagine how hard it is to play dodgeball while wearing shackles). “We have placed the teacher on leave, pending the findings of the investigation,” wrote Superintendent Bryan Davis, who should not be trusted because he spells his name with a Y. “Our school counselor, school psychologist, Dean of Students and the SIS principal have been providing support to the students who were directly involved in the incident. The school’s English teacher did not comment on whether or not she would continue with her plan to have the black students reenact a game of Hangman. 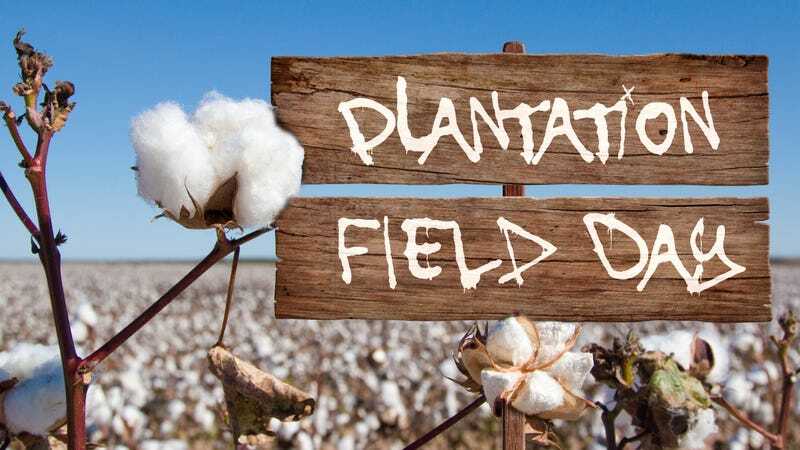 South Carolina School Celebrates Black History Month By Having 5th Graders Pick Cotton to &apos;Slavery Songs&apos;... No, Really.